In contrast to the recent Federal Reserve announcements that US Dollar interest rates would not be falling, the government of Japan has announced a new round of "stimulus". Japan will devalue its currency through inflation to prop up its markets. This news has helped cause a rally in worldwide stock markets. It has been my assertion for years that Keynesian "spending = wealth" economics are purely a Neptunian phenomenon and a symptom of the Age of Pisces. I see the thought processes driving this ideology as religion and not science or logic. I believe, accordingly, that government actions driven by the Keynesian religion will inevitably fail. 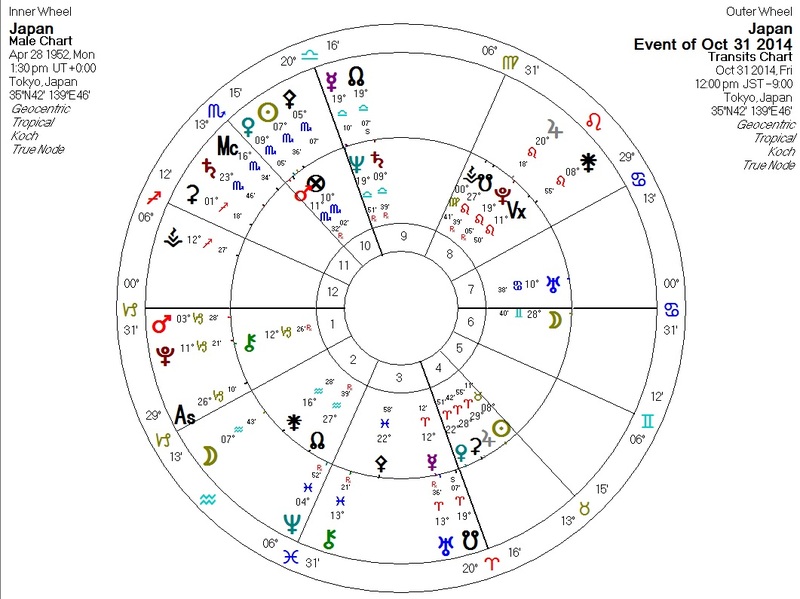 Note transiting Jupiter conjunct Japan's Pluto in the Eighth House: powerful debt expansion. Transiting Mercury and North Node are at Japan's MC conjunct Japan's Neptune: an announcement (Mercury) of the beginnings (North Node) of a great dissolving (Neptune). Similarly, the transiting South Node is conjunct Japan's Venus at the IC: the deprecation (South Node) of value (Venus) at home (IC). Transiting Pluto has been opposite Japan's Uranus, which rules the sign of Aquarius which is intercepted in Japan's Second House: the destruction (Pluto) of wealth (Second House). Finally, transiting Venus is conjunct Japan's Mars: the combination of action (Mars) and value (Venus). This by itself might even be a very short-lived positive financial indicator, but transiting Venus is no match for Neptune, Pluto, and the South Node. The Neptunian faithful who run our governments continue to worship their watery god by sacrificing the physical well-being of their people to him. Astrology reveals the true dynamics of what is happening. Good luck to the long-suffering people of Japan. Perhaps when Neptune finally leaves Japan's Second House in the next year they may see more stable times.